Lund’s regional competition success allows her to advance to the National Finals this July 13th-16th in Las Vegas, Nevada. There she will compete against other 8 and 9 year olds for the title of National Champion. Lund was one of 5 junior dancers from the Northern California region to be selected to Team Hollywood Vibe in addition to teammate Tyler Riekki, which invites them to join the Hollywood Vibe tour throughout the nation. This is Lund’s third consecutive score of Platinum, requiring an average judges score of 96% or higher, for her solo in competition. Earlier this year Lund placed 8th overall for her Platinum performance at Hall of Fame. 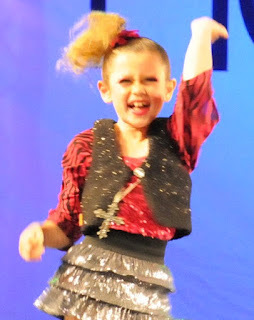 Her Platinum score at Hollywood Connection dance competition qualified her to compete for their Icon of the Year Award and an audition with talent management agency DDO Artists Agency. Dellos Performing Arts Center (DPAC) boasts a multitude of awards from this weekend’s competition. One of the company’s hip-hop dances, called “Bring Back Double” was just one of the four dances for the coveted award of Battle of the Stars competition. The dance qualifies DPAC to compete against the most highly rated dances from across the country to win the best dance of the season award. In addition to Bring Back Double, many of Dellos’ dances received top honors including Top Junior Tap with Shawty’s Got Moves, Top Junior Hip Hop dance called Fix Up Look Sharp, Top Junior Lyrical dance titled Back to the Start, Top Junior Contemporary with The Dance, Top Junior Jazz with Get in the Zone, Top Musical Theatre with Hard Knock Hood and a First Place Platinum award with the Senior Hip Hop dance Head Bust. Jordan Clark, one of the senior dancers for Dellos also received a Platinum award for his unique solo called “The Composer”. In all, the studio received seven top overall awards in the junior division, the highest number of awards provided to any studio at the competition. Alexandra Lund began her dancing education along with many of the area’s youth at the Academy of Dance under the guidance of Ms. Harmony True. Lund’s parents credit True’s ballet fundamentals as the cornerstone that prepared their daughter for success as a dancer. For the past two years, Alexandra Lund has been a company dancer for Dellos Performing Arts Center under the instruction of studio owner Johnna Clark and teacher/choreographers Tahirih Ellison, Marco Cruz, and Jillian Clark. She is also an honor student at the Laureate School. Dellos Performing Arts Center (DPAC) has emerged as one of the premiere dance studios on the Central Coast since opening its doors in 2006. The studios competitive team has enjoyed tremendous success with several National Championship teams and dancers in the past few years. Many alumni have gone on to college dance teams, professional sports dance teams and professional dancers, but owner Johnna Clark states that creating professional dancers is not the studio’s focus. “We opened the doors to create a safe place for kids to fall in love with dance. Our passion is to teach important life skills through dance and that creates successful young people in any walk of life they choose,” explains Clark. Hollywood Vibe is one of the elite dance competitions in North America. Its faculty and judges are all professional dancers, many from the popular television dance shows like So You Think You Can Dance (SYTYCD). This year’s SYTYCD judges included, Kent Boyd, from Season 7; and Season 5 stars Ade Obayomi and Melissa Sandvig. Other judges at the event included Hollywood Vibe owner Christopher Smith, whose film career spans hits like The Wedding Planner, Rent, and Annie. Joining Smith is legendary tap superstar Mark Goodman, who is known as Gregory Hind’s sidekick and received accolades for his tap performance in The Polar Express. Congratulations to Alexandra , "Sparkles"! We are loving watching you become a star! Thanks Amy. Hopefully Alexandra and Bella will get to play together a lot this summer.